Gentle Readers, it’s cold. It’s frigid here in Nebraska, where an “Arctic Cold Front” (that’s what the cheerful weatherman called it) has swept over our area and parked here for a few days. Here’s the sad state of affairs, my friends; this is how desperate we have gotten: it’s early morning and 4 degrees as I write this, and I’ve just checked the weather forecast, and I actually feel ebullient because the high today is supposed to be in the teens. Yes. In the teens. It has been so cold that the thought of 15 degrees today sounds like a blessed heat wave. Yesterday’s high was 4°. Nebraska is such a nice place to live, but there are drawbacks, one of which is that we get the extremes in the summer (over 100° at times) and in the winter (it hit -15° last night). I know that we aren’t alone in this, and that’s a comfort. The entire Midwest seems to be shivering right now. But oh well. As they say around here, if it doesn’t kill you, it’ll make you tougher, and toughness is a quality that we all value very much. Toughness, common sense and resourcefulness are all qualities that I was raised to admire, and if you toss in a reasonable sense of humor, and a calm resignation to always “make the best of things,” you have the heart of the typical Midwesterner. We haven’t had much snow yet this winter, sadly. And you know, that’s true. The electricity could go out. The house could catch on fire. The cat could get sick on the new couch. We could all start throwing up, in tandem, and run out of buckets. God forbid. A fox could come and clean out the hen house. You know that things could always, always be worse. Along those lines, if you can’t think of any other reason to be thankful for the cold (I can think of a few, actually: for one, I can wear my new wool Christmas socks!) then it gives you an excuse to tell jokes about it. Ole and Lena, a farm couple from the Midwest, sat at the kitchen table at breakfast. The morning weather report was playing on the radio. “A snow emergency has been declared today, with 3 to 5 inches of snow forecasted . . . All vehicles should be parked on the odd-numbered side of the streets today to allow for snowplows,” the radio voice announced. “Oh, gosh, okay,” said Ole, bundling up and heading outside, and dutifully parking his car on the odd-numbered side of the street. Two days later, again the morning weather report was playing while the couple sat at their breakfast table. “The snow forecast for today is 2 to 4 inches of new snow, and a snow emergency has been declared. All residents are requested to park their cars on the even-numbered side of the street,” the radio announcer declared. Once again, Ole sighed, got up from his breakfast, bundled up and went out to dutifully park his car on the even-numbered side of the street. A few days later, the weather report was similar: “There will be 6 to 8 inches of snow today, and a snow emergency has been declared. Every resident must park his car on the . . . ” Just then, the power went out. The radio was silent, and Ole and Lena sat in their dark kitchen. The weather outside is frightful, but guess what: it’s not too early to start preparing for your spring garden! 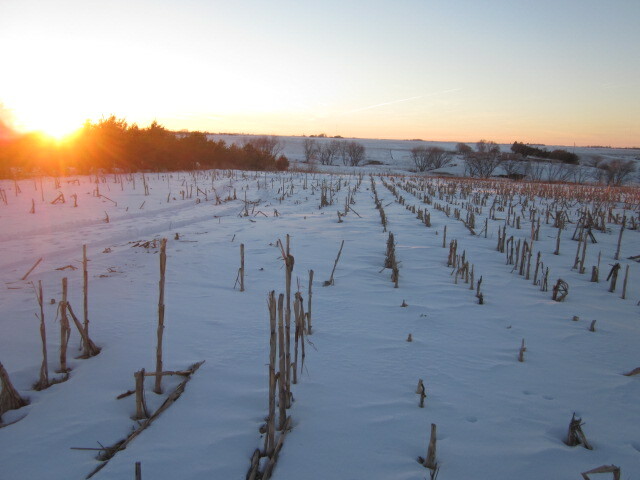 Actually the timing for spring planning is perfect, with Christmas festivities over and packed up for another year (well, mostly) and a good three months before you can get your hands into the soil (the blessed soil) that is, if you live in the Midwest. You might actually have a little time on your hands, eh? So without further ado, here are a few things that you can work on NOW to get a head start on your garden season! 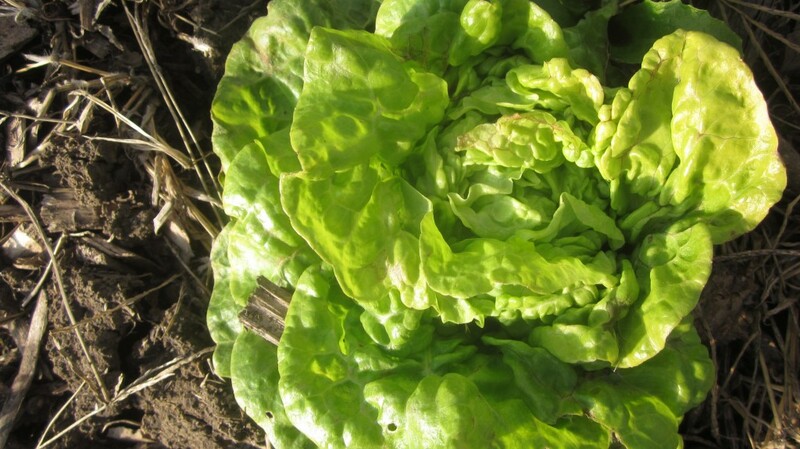 Remember Tom Thumb lettuces? Yum! I’ll plant more of them this year! 1. Make your garden plan. I’ve got to admit that I’m really horrid at doing this, once spring is in full bloom. There are not enough hours in the day! I’m in such a hurry to get seeds planted and seedlings into the ground and mulch moved, that I don’t want to take the time to sit down and make some silly plan. But now . . . the recliner next to the wood stove is a mighty inviting place, and sitting down to make a plan is a pleasant way to spend an hour or two in the evening. There are lots of ways of doing this, but I like to keep it simple, (stupid–sorry) and so I usually just grab a legal pad that I keep all my garden notes on, and I first make a list of all the crops that I plan to grow. Do this now, while your last year’s garden is still fresh(ish) in your mind. Then I draw out my garden spaces and try to sketch everything in. It’s very simple, very unrealistic, but it gives me something to go on, instead of a spring-addled brain that can’t focus on anything but . . . green grass! Birdsong! Blue skies! Warm dirt! Sunshine! See, there I go . . .
A word of advice: don’t get on Pinterest or the Interweb or some cool blog or whatever site you tend to gravitate to and look at pretty garden plans, all done up in watercolors or on fancy graph paper, or whatnot. I’m possibly speaking from experience here. If you do this, you’ll maybe use up the hour or two you had available to you to plan, and you’ll not get anything on paper. Just make your plan. Quickly. Now. Oh by the way, look at the pretty watercolor garden plan I found on Martha Stewart’s website today . . .
My family just loved these winter radishes that I grew for the first time last year! 2. Order your seeds! Oh, this is the pleasantest occupation of all, aside from bouncing a grandbaby on your knee. And you can go into it with all seriousness, since your family’s good eating is dependent on your doing a good job . . . right?? It may look like you’re enjoying yourself, with your steaming cup of hot tea, surrounded by your seed catalogs, ensconced as you are next to the wood stove (I’m very fond of my wood stove) but that is not the point. Maybe the hubster will have to make himself a sammage for supper. Maybe the mewling infants will have to do the dishes for once. But it will be worth it, if you get your seed orders in on time! Here’s the deal: lots of those glossy catalogs that you’ve been getting in the mail since, oh, say, late October, will run out of the seeds for the crops that you want the most, if you wait much longer. It happens! Last year, I reallyreallyreally wanted seeds for a new heirloom blue cherry tomato, but I waited too long, and they were sold out! I hope not to make this mistake this year! 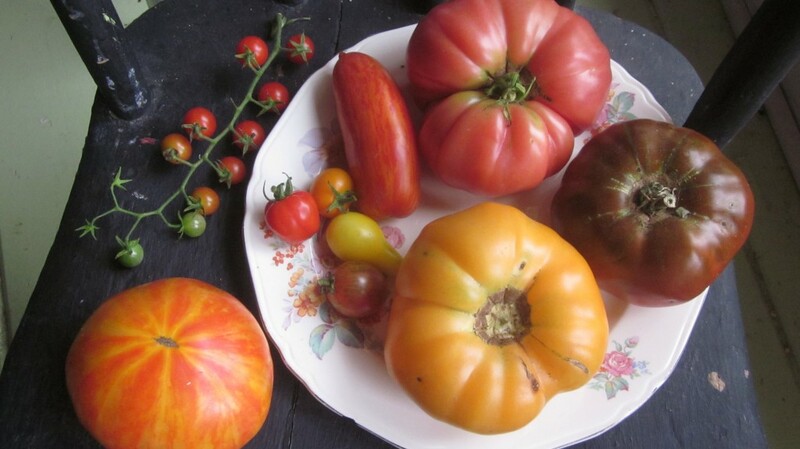 I plant primarily heirloom seeds, and I go into just why I do, in this blog post. Here are just a few heirloom tomatoes from my garden last year. 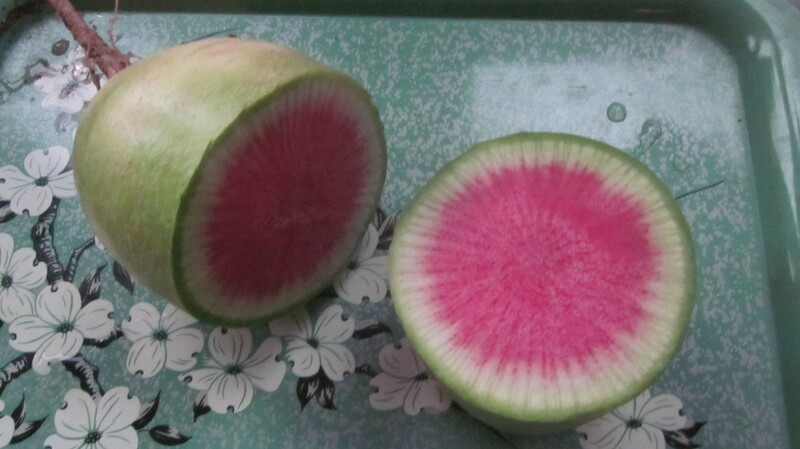 Gorgeous, and delicious, too! So I favor catalogs that sell mostly heirloom seeds. Heirloom crops are gaining popularity, year by year, partly because home gardeners are finding out just how easy and satisfying they are to grow, because there is such an incredible range of varieties to choose from, because you can often save seeds from your crops year after year, and because of the excellent heirloom seed catalogs that are available! Yay! Baker Creek Heirloom Seeds: This is such a pretty catalog and is just packed with gorgeous color photos of heirloom fruits and veggies. The friendly folks at Baker Creek Seeds in Missouri offer over 1500 rare non-GMO seeds. You’ll have to pay for the catalog if you order it from the website, but if you order seeds, they’ll send you a free one next year! Bountiful Gardens: This catalog is a project of Ecology Action, a nonprofit dedicated to ending world hunger by teaching sustainable agriculture. 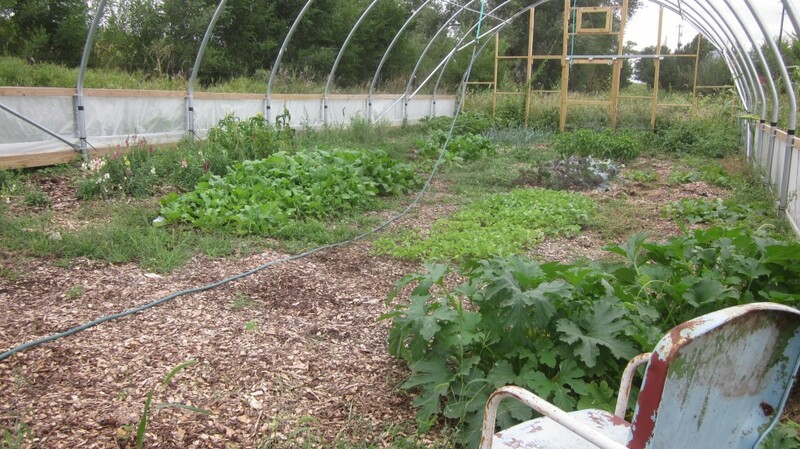 They’ve developed a simple, sustainable gardening method called GROW BIOINTENSIVE®. What an impressive organization! This method allows gardeners to grow large yields of vegetables in a small space, while the soil gets richer and better from year to year. It is ideal for home gardeners, and for anyone who wants to grow good food naturally. I got my wonderful Orange Jelly Turnip seeds from here last year. And the Homeschooler’s Parsnips that everybody devoured with relish. Great catalog! 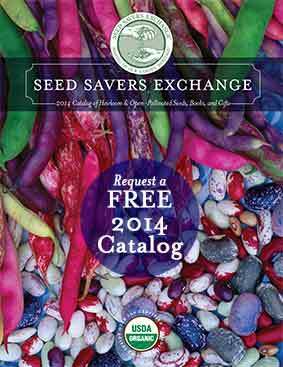 Seed Savers Exchange: This pretty 100+ page, 2014 Seed Savers Exchange catalog is free, and a source of over 600 heirloom and open-pollinated varieties. This year’s catalog also includes many new introductions from their Preservation Collection, and a large selection of organic seeds. Not only does this catalog have beautiful images and stories for their collection of heirloom and open-pollinated seeds, it also contains great educational material! It’s great! Territorial Seed Catalog: This family-based business has grown impressively in just a few years, going from growing their own crops for seeds in a neighbor’s garden plot, to sending out hundreds of thousands of gorgeous seed catalogs every year. They are based in Oregon and have a beautiful, free catalog. 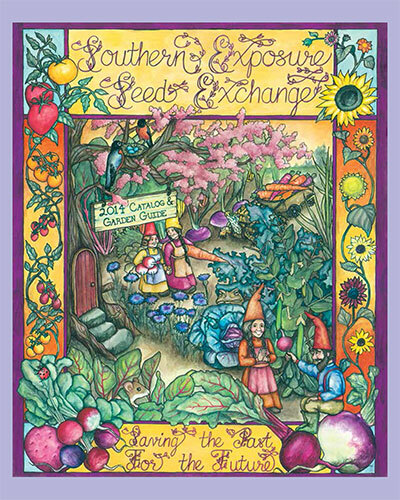 Southern Exposure Seed Exchange: Southern Exposure’s motto is “Saving the Past for the Future” and their catalog offers not only heirloom seeds and gardening accessories, but also lots of useful information and interesting stories, also helpful hints about disease and insect control, seed saving, and other cool stuff, including a very large selection of garlic cultivars! Are you getting excited about your spring garden yet? Okay, so you’ve made your simple garden plan and you’ve ordered your seeds. But have you thought about this? 3. Do some weight work NOW. This may seem like a random suggestion, but you know how awful it feels to go out in the early spring, the hoe in one hand and your precious seed packets in the other, and you’re full of ambition and vim and then . . . you raise the hoe up to make a furrow and . . . the hoe . . . *gasp*. . . weighs a ton . . . what has happened . . . and when you glance over at your arm, you drop your hoe in alarm! Something has happened to your muscles over the long, cold, inactive winter . . . there is absolutely no muscle tone! They are hanging there like an empty hammock, like the muscles on your sweet (but aged) third-grade teacher’s! Clearly, your garden dreams are over! Honestly, I discovered this the hard way. I’ve worked out diligently some winters and other winters have taken time off from the exercise routine, la-de-daa. So I know from experience that my spring planting and necessary chores go so much better when one is strong and ready for it! I have a number of workout videos in our basement movie-closet, and a nice variety of weights. You probably do, too. Push-ups are great, and so are bicep curls, dead lifts, squats, etc. Start today! 4. 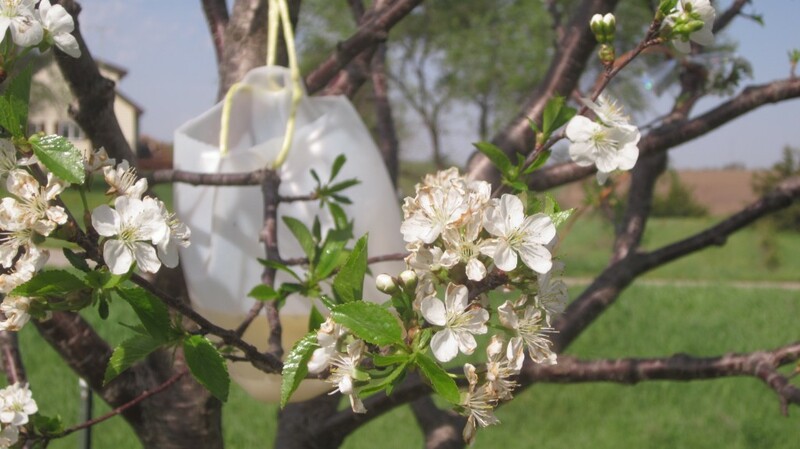 Start collecting milk jugs: if you have fruit trees that are prone to insect infestation, you’re going to want to mix up this all-natural fruit tree insect bait to hang in jugs in your fruit trees. It really works, but you’ve got to have it out there before the bugs make their entrance! You just can’t wait around for the kids to drink the gallons of milk so you have jugs to use! The happy thing is, I think I’ve found an answer to the weed problem in the Back to Eden Gardening method. My friend Anne and her husband Boyd went all-out and did their garden this way last year, and I wrote about it on my blog. You can check out the post, and the follow-up post, too, if you’re interested. And if you struggle every year with weeds, you ought to be interested! I mean, really, think about it: what would you do with all that weeding time, if there were no weeds to pull . . . . ? It really does give one pause, does–it–not? So to that end, I’ve already got one large trash bin in the garage full of newspapers, and my nose is in the air, sniffing out fresh wood chips. My goal is to have a very large pile of them ready to spread in the spring. A new friend (thanks Mari!) suggested that I call all the tree-trimmers and electric companies in the area and tell them that I’ll take any loads of wood chips that they have available to dump in our area. We are just around the corner from the local landfill (alas) so we’d be on their way, in any case, and I could save these companies some dump fees. That’s the plan, since my Number One Wood Chip Hauler and All-Around Good Egg, son Timothy, has gotten himself a great job in the city and just isn’t around as much to do favors for his ma! I’ve got lots of wood chips in my hoop house, but I’ll need a fresh layer in the spring! That’s it for today, Gentle Readers! If winter has you hemmed in and you’re beginning to despair of ever seeing the color green again, have hope! Spring and planting time will be here before you know it, and won’t you feel clever for having taken these pre-emptive measures before you really needed to? 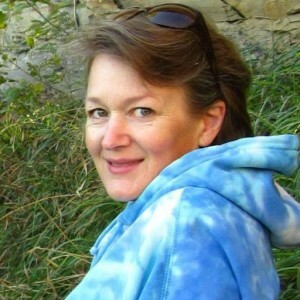 Hey, I’m linking this post with the great folks over at The Prairie Homestead, as is my wont, at Jill’s fun weekly Barn Hop. Join me! ← How to keep your hens laying eggs all winter long: my top 5 tips! Dannie, are you in Australia? My husbands family is from Nebraska and we’ve vistied there several times. But I love you ideas of planning out the garden ahead of time. I just wish that I had space and time for a garden. Oh Catherine, try just a tiny one. You’ll be HOOKEd and you’ll make time for it! Ahhh, that was a nice dream. When we lived up North I loved my garden. I had raised beds, it was fun to go out there and work with the plants. Now that i live in Texas I haven’t had a successful garden and have given up. So it was nice to dream with you but that is all it will every be for me. Shawn, don’t give up! I moved to Texas from the Pacific Northwest and I know what you are going through. But persevere, my friend, all is not lost! You just have to twist your mind into a southern shape and try new things. The first thing to do is to throw away everything you thought you knew about gardening. I had been a Master Gardener. Now I am a novice, but at least I was able to can a lot of stuff from the garden last year, and will get more this year. When you look at the seed catalogs, look for those little words “loves/tolerates hot/humid weather” and you will take a giant leap forward. And be happy! We can grow things they only dream about in the north with their short growing seasons. Um, yes, that would be us, in the North with our “pitifully short growing season.” Well put, Mari! And Shawn, I wouldn’t give up. If you really, really want to grow your own veggies, you’ll find a way! Shawn, I don’t know what part of Texas you’re in—I’m assuming it’s hot and dry, right? I would echo Mari’s comments above, that you should never give up! Look around you, are there any successful gardeners in your area? What are they doing to be successful? And one thing I might add, Shawn, is that with a VERY VERY THICK layer of mulch, you don’t need as much water. I can’t wait to start getting my seed catalogs! You DO make me yearn to plant vegetables next year, even if my garden and my disability won’t allow it. All this seeds and people looking bright and alert while they harvest their produce makes me smile. So does your enthusiasm. Yes, pulling weeds is a complete waste of time. Use anything you can get hold of to cover the bare earth or nature will do it for you. I had to chuckle (but only under my breath) when you said that when you tried to get your seeds and they were out. I will tell you why! All of us southern gardeners have to get our seeds early. Mine are all laid out on my table, sorted by what needs to be planted indoors and what is direct sown. Now I am making a list of what is planted when. I start my first seed beds indoors the middle of February, then go outside and plant those things that are supposed to be planted as soon as the ground can be worked. Our ground can be worked pretty much all year round! I just dug up my sweet potatoes a couple weeks ago. I will plant my seedbeds in about a month. I was excited about your seed catalogs. You showed some ones I haven’t heard about and I am off to check them out. Of course, Baker Creek catalog is dog-eared, marked with the highlighter, circled in ink pen, with notes in the margins! All my seeds are heirloom – wouldn’t have it any other way – and I love to collect seeds and try them out the next year. Lastly – and I realize how long this is – I just love your site. You are my twin: chickens the same breeds (except bantams and Sussex), gardens, and fixing up your fun, fun house! Wish you were my neighbor! p.s. I never thought about the fact that you Southern gardeners were buying all the seeds first . . . so does that mean that you got the blue cherry tomato seeds, from Baker Creek, that I couldn’t get last year??? I am totally jealous of your LONG growing season. Here I am, waxing all enthusiastic about my hoop house because it extends my season, but your season is probably still longer than mine! 😉 Blessings to you, Mari. Thanks again for reading! 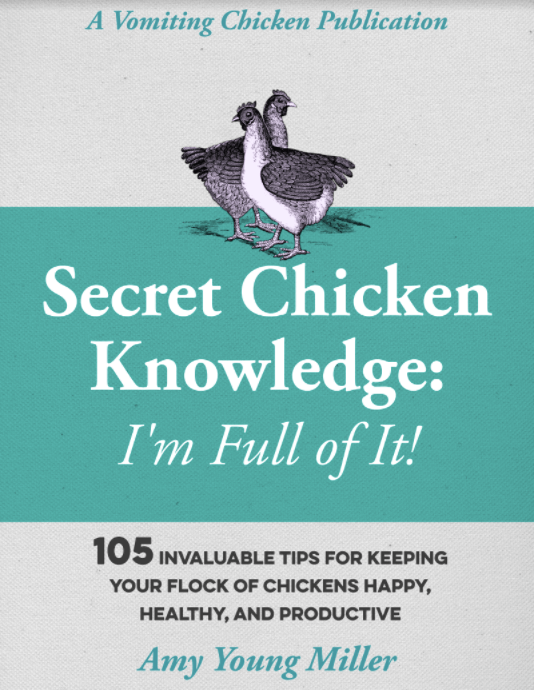 What a practical guide! Dreaming over catalogs goes without saying but the hoe-workout and planning ahead gathering are great ideas. Love the joke too! Thank you so much! Glad it helped you think ahead! Alana, I do appreciate all your pinning! 🙂 My stack of seed catalogs is waiting for me to FINISH my job of ordering, and that’s on my to-do list this weekend! It gets a bit complicated for me, with a box of seeds left over from last summer, that I need to go through: which ones will still be good next summer? I hate for them to go to waste! I ALWAYS over-buy (shhh, don’t tell Bryan) because I’m totally swept away, this time of year, by my ridiculous longing for springtime. Thanks for stopping by, @Sophie! There is one more company that Paul Gautschi (BTE) mentioned is Fedco. Have no idea what it is but will check it out as I’m a beginner. Thanks for the seed companies as I have always wanted to know which is best. I had to laugh about weeds in the garden because it is the all time ultimate that I despise too. My neighbor had TONS of weeds on her carrots that we had to pull and I told her no more for me unless we do the BTE woodchips. This year we have them covered in chips and no weeds…yipee!! PS…make sure you call your one favorite guy that gives you woodchips once a year and REMIND him to keep you on the list and that you still want woodchips!!! Thanks for the tips, Rose! I always do a happy dance when my woodchip guy comes rumbling down the driveway, and you’re right, I do need to call him every year. I’m planning to get the FedCo catalog, and I’m thankful that you mentioned it, because I had intended to last year, and forgot. You have to call and request it: here’s the number: (207)426-0090.